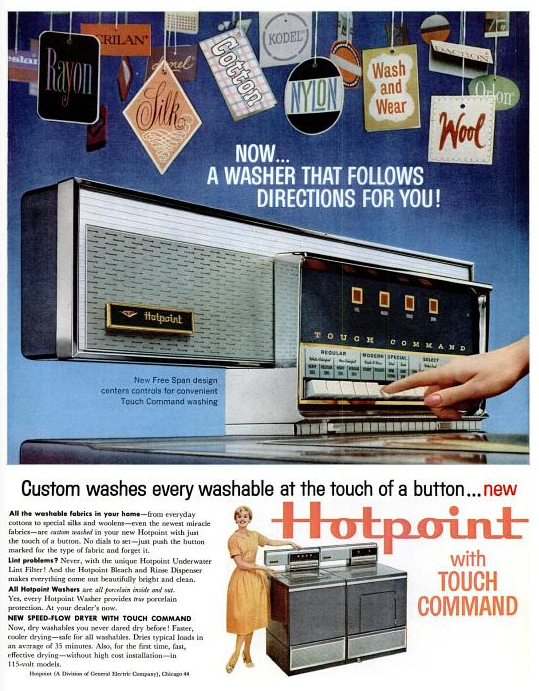 The cantilevered control panel on this 1960 laundry pair is positively wacky. Called the 'Free Span' design, it purports to conveniently center the controls for easy operation, but such a claim seems to be, if anything, out of line. Maybe the electronics [Did those even exist in 1960?] that stored all the fabric-care formulae in use during the Age of Acrilan were too big for a single housing, and had to expand. In any case, the angular design is a far cry from the bloodless digital displays found on machines today.